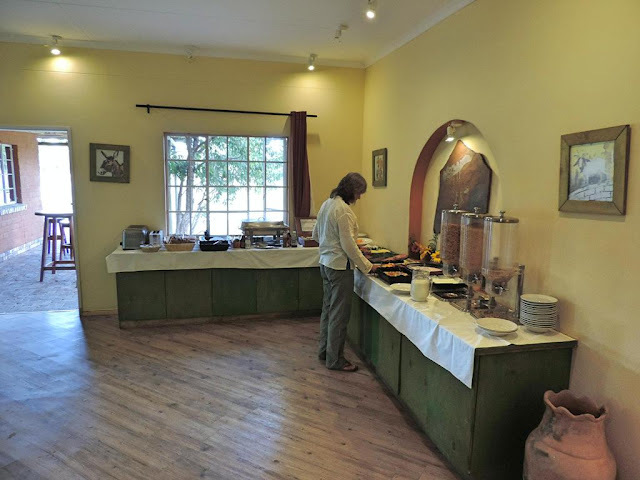 We stayed the nights of December 15th and 16th at Gondwana Collection's Damara Mopane Lodge. 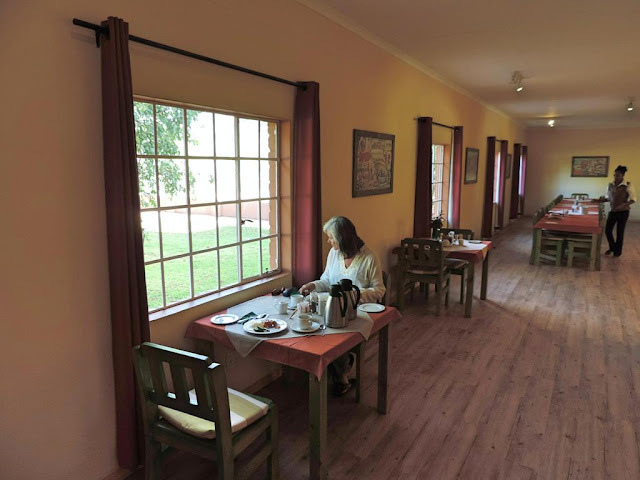 This lodge is located about 425 kms (264 miles) north of the capital city of Windhoek so many people make it their first stop if they're heading towards either Etosha National Park or the Opuwo region. We find it totally amazing how an oasis like this can be built in such a barren landscape. The lodge is located about 3 kms (1.8 miles) off a totally straight section of main highway, and beside a huge rock hill. Located at the green arrow. Entrance gate to Damara Mopane Lodge. There are 55 chalets. We were assigned #4, one of the very few with a nice view of the pool area. View from the front window of our chalet. Many people who come to stay at Damara Mopane Lodge are there to do a day excursion to the three most popular area attractions. Twyfelfontein, the petrified forest, and the organ pipes are all within a 130 km route. Our room was fairly basic, but certainly comfortable. There are a couple of things about Damara Mopane Lodge that are quite different. The most interesting is that each chalet had a walled garden where they actually grow a lot of the vegetables that are used for your meals! It's really well done, and well maintained! 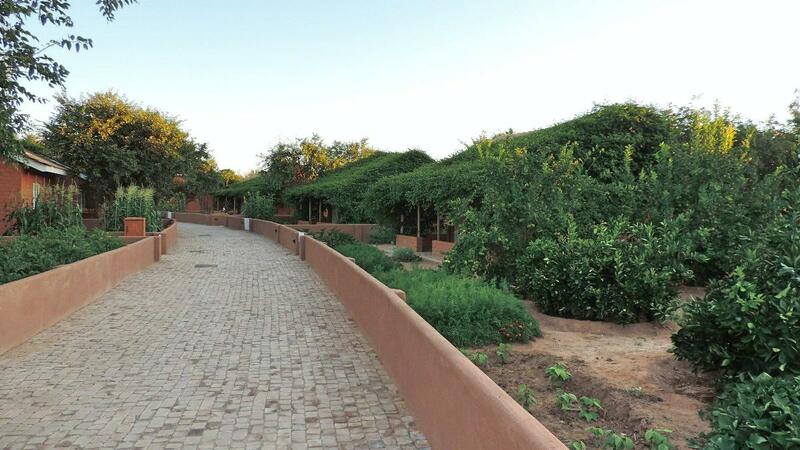 Each chalet has a vegetable garden. All of these fresh fruits and vegetables have got to make for some good food. Breakfast was buffet style. Damara Mopane gets a lot of bus groups coming in and they like to get an early start to their day trip so I would expect this is the fastest way to feed everyone. Not quite as nice as being able to order your eggs the way you like them, but still a decent meal. Ruth, in the breakfast room. And at the breakfast buffet. 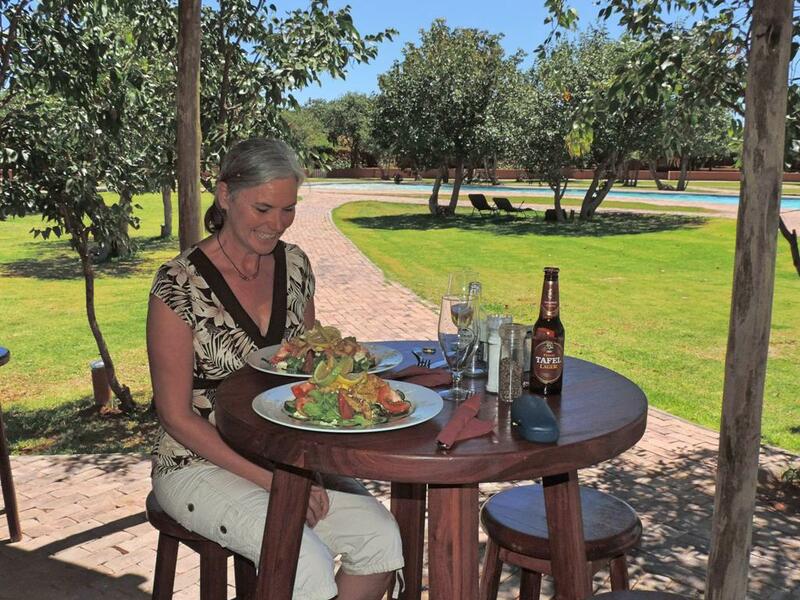 But our best meal at Damara Mopane was our lunch. Sat in the shade at the bar, overlooking the pool, we ordered a chicken salad. Well, we didn't need any dinner! The other interesting thing at Damara Mopane Lodge is the swimming pool itself. It's beautiful, and by far the largest at any of the lodges we have been to so far. But of course it has to support maybe 100 people when the lodge is full. One problem. There are only about 14 lounge chairs, and some of them are in pretty poor condition. This would be our only complaint with this lodge. Gotta get some new lounge chairs! And maybe build a shade structure or two. Yes, there are some trees for shade, but when the place is busy that wouldn't be enough. Oh, and they have a couple of hiking trails. One that leads up to the top of the hill behind. Fairly steep, but great views. And a short one that leads to their "sundowner" deck where you can have a cold drink while you watch the sun set. We had a great stay at another one of the Gondwana Lodges! 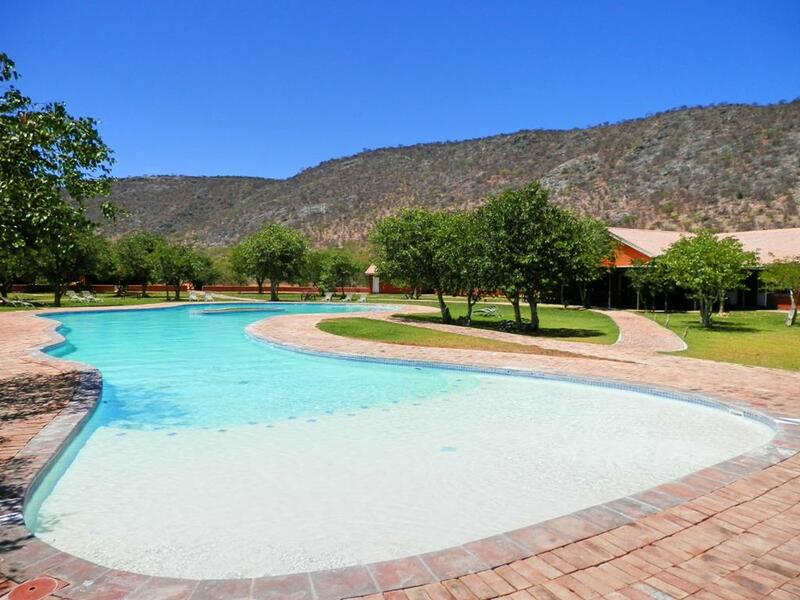 Next up, Namib Desert Lodge! Hm. Well, my comment disappeared, hopefully it doesn't show up twice. That version of the window seat is considerably better than most. We've tried to always have a window seat at breakfast, but sometimes it just looks out onto the street.